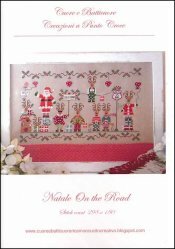 Natale On The Road [G1137] - $14.66 : Yarn Tree, Your wholesale source for cross stitch supplies. Cross stitch pattern by Cuore e Batticuore. Santa Claus and his reindeer are traveling the legendary Route 66. Delivering toys along the way to their final destination of California. Stitch count 298 x 180. Stitched on #3643 Edinburgh Linen light mocha.